Updated 10:07 p.m., 10:18 p.m. The Michigan State University Museum opened an exhibit of art and artifacts related to the survivors of the Dr. Larry Nassar sexual abuse scandal on Tuesday, in a ceremony that featured emotional testimony from public and MSU officials as well as the survivors themselves. Boyce says she was the first student to inform the university about Nassar’s predation more than 20 years ago, in 1997. Amanda Thomashow, another “sister survivor” and co-curator, called for greater accountability on the university’s part not just regarding the Nassar scandal, but with its alleged “culture of silence” around sexual assault. She specifically acknowledged Bailey Kowalski, the MSU senior who came forward last week as the anonymous plaintiff in a Title IX lawsuit in which she claims to have been raped by members of the school’s basketball team and discouraged from reporting the incident. Other officials who appeared at the event included Michigan’s Solicitor General Fadwa Hammoud, state Sen. Curtis Hertel (D-East Lansing), MSU Board of Trustees Chair Dianne Byrum and U.S. Rep. Elissa Slotkin (D-Holly) in a video statement. Last year’s Senate Bill 872 extended the window in which survivors could sue for damages in civil cases from three years to 10 years, and another 2018 bill extended the statute of limitations in a similar fashion for criminal cases. Hertel said that some co-sponsors of those bills would be involved in the new legislation, but declined to name them. 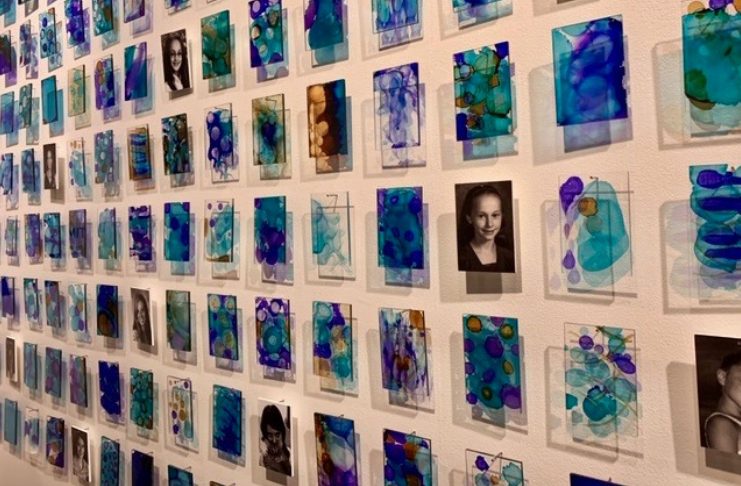 The exhibit itself features photos of Nassar survivors, original art, a timeline of the scandal, and preserved memorabilia from the following uproar on campus, including replicas of the trademark teal ribbons that were wrapped around campus trees in a show of solidarity with the survivors. The university’s need to improve education and prevention surrounding sexual assault moving forward was a common theme from the night’s speakers. Acting MSU President Satish Udpa called for “institutional accountability” in a statement delivered by video. The exhibit will be on display until March 2020. This story has been updated with comments from state Sen. Curtis Hertel and to clarify the scope of his planned legislation.